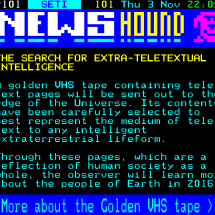 A golden VHS tape containing teletext pages will be sent out to the edge of the Universe. 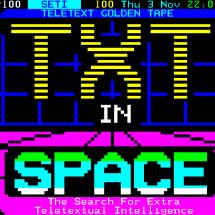 Its contents have been carefully selected to best represent the medium of teletext to any intelligent extraterrestrial lifeform. Through these teletext pages, which are by extension a reflection of human society as a whole, the observer will learn more about the people of Earth in 2016. 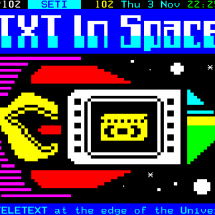 Among the teletext ‘icons’ to be fired into deep space are palm trees and a live football scores teleprinter.